It was a case of déjà vu at Berkeley Institute on Saturday night after the judges once again could not separate Teresa Perozzi and Tori Nelson. The WBC World Middleweight belt remains unclaimed after a thrilling climax to Fight Night 15 fight that saw both fighters up the ante from their first bout - also a draw - in October. The highlight was a brutal third round that saw home favourite Perozzi put on the canvas before storming back less than 30 seconds later to repay the compliment, putting the American down with a shuddering left hook. 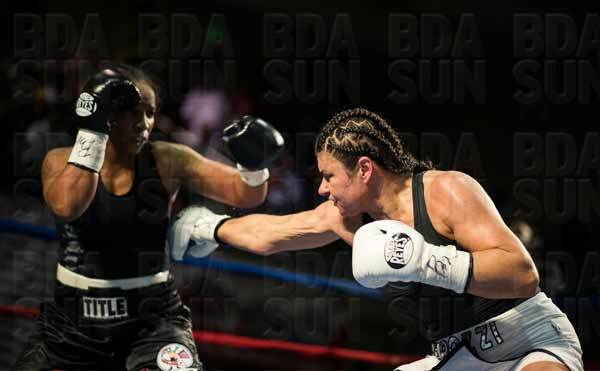 At the end, though, both women were left frustrated as Judge Jack Woodburn (Canada) scored it 97-94 to Nelson, Julie Lederman (USA) saw it even at 95-95 while William Boodhoo scored the bout 96-95 in Perozzi's favour. Perozzi said: “I don't even really know what to say right now, I'm just disappointed. I?really thought I'd won, especially the last three rounds. I?feel I?did enough to win. “It hurts because I've done this for so many years without a trainer and now I've done this twice with the best training of my life with a guy (Troy Darrell) that deserves this more than anybody and I?just don't know what to say. Nelson added:?“Last time we fought I?went in aggressive and I brawled her. This fight I?boxed her because they didn't give it to me when I?brawled her so this time I?figured if I?boxed her I could get it so I?don't know what they want.